I don’t love it quite as much as the rhino, but this Threadless T-shirt showing Botticelli’s Venus getting work done is still pretty awesome. Thanks to Shapeling Emily for the tip! ‹ PreviousAsk Aunt Fattie: How can a fat woman find love? Wow. I really appreciate that image. It looks like she already got a lot of “work done.” Her body on the tee is much more the modern ideal than in the original painting. Just sayin’. The teeshirt artist already “did some work” on Venus. The new figure already more closely reflects the current “skinny ideal” our culture is obsessed with. She has a far smaller stomach, waist and arms than the original. I think the design would have worked better if the artist had used the original figure and not capitulated to present predjudices. Heh, I came in here to say just what Dee and amgriffin already said… tweaking the image by already slimming her up isn’t doing the underlying point any favors, in my opinion. In other news, I just saw the original of this painting last week, and girlfriend has CHUBBY ANKLES. I was delighted. Botticelli figures are quite slim as Renaissance women go, but for some reason I just loved that her ankles were so sturdy. I totally bought one! can’t wait, and shipping was only $5! I appreciate the idea behind it, but I can’t get too excited about the image. I don’t like that she’s been slimmed down already, and that she no longer appears to have any muscles. Her legs and arms weren’t just big, they were strong! The Venus on the t-shirt is small and spindly…. No thank you. They’ve done enough “work” to her already. Whatever point they might have made is ruined by they’re refusal to use the strong proportions of the original. They want to make money off of a clever idea and they might think they’re being progressive or body-friendly but the fact is they still decided that the original Venus needed a nip and a tuck before they’d put her on their shirt. And I don’t believe it’s just an artistic choice either. Perhaps we’re supposed to take away from the image that she has already had work done and still needs more, as bookwyrm suggests, but I think that is an overly charitable interpretation and even if it IS the case it’s not made clear enough to ever make me comfortable enough to wear that. Also, it’s ever so nice to be reminded that if I’m above a 2X I no longer get to be girly. I must lose all traces of femininity and become “unisex”. Maybe I’m just in a bad mood today or something but I can’t bring myself to love it. Yeah, I loved the shirt as soon as I saw it. Would have been so much the nicer with a more average figure to begin with. Or at least, hell, tracing over the original painting, y’know? amandaw – that’s what I thought. 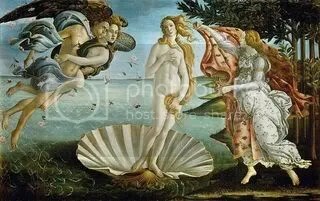 It’s pretty amazing, when you really think about it, how far off Botticelli’s Venus is from our modern cultural ideal. It is way off. I can just imagine Venus as a present-day celebrity going to the beach in her bikini and the next day there are articles in all the tabloids about how she’s let herself go, and lots of do-gooders tsking that she’s setting a bad example for today’s youth by reveling in her ugly diabetes-craving flesh. I have I guess you’d call it paper doll frig magnet of both Venus and David…they are amazing!! The store I bought them in is no longer there and I’ve moved anyway. I love them….you get a bunch of clothes to put on them. I’ll google it and see if I can find a site to get them.